Spondylolisthesis is a Latin term meaning slipped vertebral body (spinal bone). Spondylolisthesis in the lumbar spine is most commonly caused by degenerative spinal disease (degenerative spondylolisthesis), or a defect in one region of a vertebra (isthmic spondylolisthesis). Degenerative spondylolisthesis is very common, and occurs as a result of due to degeneration or wear and tear of the intervertebral discs and ligaments. Osteoarthritis of the facet joints can also play an important role in the development of instability and slippage. Degenerative spondylolisthesis usually occurs in people over 60 years of age. 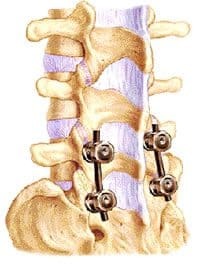 In degenerative spondylolisthesis, what usually happens is that ongoing degeneration weakens the facet joints and disc, and (typically) the L4 vertebral body slips forward on the L5 vertebral body. Under normal circumstances, the L4-L5 segment is the one in the lumbar spine with the most movement. It is therefore most likely to slip when this process occurs. The next most common levels affected by degenerative spondylolisthesis are L3-L4 and L5-S1. Isthmic spondylolisthesis occurs most often at L5-S1, and is more often seen in younger adults than degenerative spondylolisthesis. The cause is a defect in an important bridge bone (the pars interarticularis) of L5. When one vertebra slips entirely off the one below (>100% slip), this is known as spondyloptosis (see picture). Spondylolisthesis doesn’t usually have any symptoms. In fact, it is commonly seen on X-rays and CT scans as an ‘incidental’ finding. It may, however, produce significant symptoms and disability. 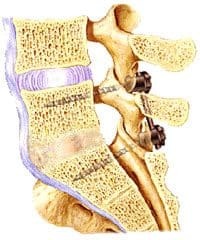 As the spine attempts to stabilise the unstable segment, the facet joints enlarge and place pressure on the nerve root causing lumbar spinal stenosis and lateral recess stenosis. 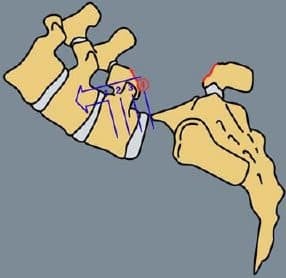 As one bone slips forward on the other, a narrowing of the intervertebral foramen may also occur (foraminal stenosis). Severe nerve compression can therefore occur with pain, numbness and weakness in the legs. Sometimes loss of control of the bladder and/or bowels can occur due to pressure on the nerves going to these important structures. Imaging studies including MRI and CT can show a slip, as well as narrowing (stenosis) or compressed nerves in the spinal canal. The CT and MRI scans are usually obtained with the patient lying flat, however sometimes a slip may only be obvious when standing or bending forwards. This is why your neurosurgeon or spinal surgeon will sometimes obtain flexion, extension and standing X-rays, and occasionally a CT myelogram. Treatment for spondylolisthesis is similar to treatments for other causes of mechanical and compressive back pain. It is usually non-operative, and surgery is only necessary in a small percentage of patients. Your specialist may suggest that you modify some of your usual physical activities, this will help to help settle symptoms from mechanical back pain. Special braces are occasionally prescribed to ease back pain. Short periods of bed rest can sometimes help with very painful episodes. A comprehensive physical rehabilitation program can assist in settling pain and inflammation, as well as improving mobility and strength. A combination of physiotherapy, hydrotherapy and clinical Pilates typically works well and is often recommended. Having a review by a clinical psychologist can be helpful in for creating strategies to manage pain. It is also important to address any associated feelings of depression or anxiety, as these conditions can heighten your experience of pain. Medication often plays an important role in controlling pain and easing muscle spasms. It can also help you to get back to a normal sleep pattern. Long-term medication usage should be closely supervised as problems such as tolerance and dependence (addiction) are known to occur. Surgery is only needed only if other non-surgical treatments are not keeping your pain at a manageable level. Surgical treatment for spondylolisthesis need to take into account both mechanical (instability) and compressive (nerve pressure) issues. Nerve pressure usually involves surgical decompression, also known as a decompressive laminectomy. In order to deal with the compressive issues by taking pressure off the nerves, your surgeon may need to remove some or all of one or both facet joints, as well as portions of the lamina. As the facet joints typically provide stability to the lumbar spine, the spine can spine to become loose and unstable, especially after some slippage has already occurred. A fusion is usually therefore recommended. Similarly, a fusion is necessary to adequately deal with the mechanical issues of instability in spondylolisthesis.